Two shuttle astronauts have completed the first of five spacewalks to repair and upgrade the Hubble Space Telescope. John Grunsfeld and Drew Feustel spent almost seven hours working on the observatory, and achieved all of their primary objectives. 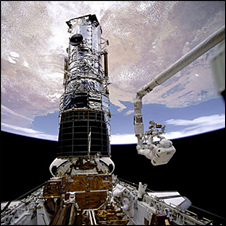 Chief among these was the installation of a new instrument, the Wide Field Camera 3, which will allow Hubble to see deeper into space than ever before. They also exchanged a data processing computer that failed last year. The break-down had left Hubble with no back-up for the unit it currently uses to route all its wonderful images to Earth. The replacement passed its initial connection tests with flying colours, ensuring Hubble now has full redundancy for its data processing tasks. Other work included fixing a mechanism that will enable a robotic spacecraft to capture Hubble at some future date. This should ensure there is a safe means to de-orbit the observatory at the end of its life. Thursday's spacewalk was not without incident. Before the astronauts could install the Wide Field Camera 3, they had to remove the existing Wide Field Planetary Camera 2. This took some time when a bolt refused to come loose as expected. The spacewalkers tried a number of different tools; but when they failed to move the bolt also, mission control authorised the astronauts to use as much force as possible. It was an anxious moment, because had the bolt broken the old camera would have been stuck in place and the new instrument would have had to return to Earth. "OK, here we go," Feustel said as he forced the bolt. "I think I've got it. It turned. It definitely turned." And then he said: "Woo-hoo, it's moving out!" Space shuttle Atlantis met up with Hubble on Wednesday while both were circling the Earth some 560km (350 miles) above the ground. Atlantis' robotic arm was used to grab hold of Hubble. The telescope was pulled down on to a bench that can turn and tilt to give the spacewalking astronauts easy access to its system bays. The shuttle launched from Florida's Kennedy Space Center on Monday. It is due to return to Earth on Friday of next week.